A new report from Black Knight Financial Services revealed that monthly mortgage origination volume fell to its lowest point on record in February. And recent prepay speeds signal even more declines in refinance volume in the near future. The company said mortgage originations hit at least a 14-year low during the second month of the year, thanks in part to an elevated share of all-cash transactions. The government share of originations has also taken a hit, with HARP refinancing continuing to slow as the pool of eligible borrowers shrinks. Despite the mortgage slowdown, traditional home sales (non-distressed) were up nearly 15% from a year earlier. At the same time, distressed transactions continue to dwindle as short sales and foreclosures become less and less common. Overall, residential real estate sales remained close to flat year-over-year, again because of the all-cash buyers, many of which were assumed to be investors. Black Knight’s Data and Analytics division SVP Herb Blecher noted in a press release that cash sales accounted for nearly half of all transactions. The good news is that mortgage delinquencies fell below six percent (5.97%) for the first time since 2008, and foreclosures were down 34% from a year ago to their lowest level since 2007. Unfortunately, this means the foreclosure pipeline is steadily growing, with the average loan in foreclosure now 2.6 years past due, compared to 0.7 years in 2008. The new CFPB rules don’t allow foreclosure proceedings to begin until after 120 days of delinquency, and data has revealed that foreclosure starts at the 90-day mark have pretty much come to a halt. Florida, New Jersey, and New York have the highest level of seriously delinquent loans (90+ days late or in foreclosure), but foreclosure backlogs have grown the most in non-judicial states like California and Nevada thanks to newly imposed legislation. Loan modification volume has also taken a hit, with activity ending the year around post-crisis lows. The only bright spot is the FHA-HAMP program, which has gotten a boost thanks to some recent program changes. Those include eliminating the maximum back-end DTI ratio requirement of 55%, and allowing FHA borrowers to be more than 12 full payments past due. Speaking of modifications, borrower equity continues to dictate re-default rates, with borrowers falling behind a second time 30% more when underwater. 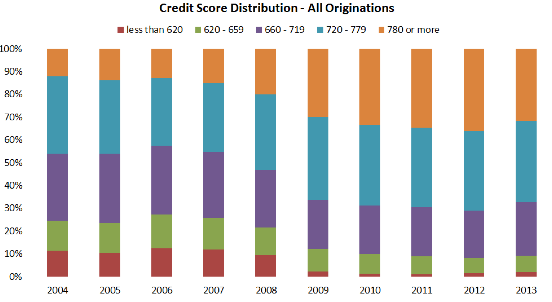 Black Knight also noted that only about 30% of mortgages last year went to borrowers with credit scores below 720, so it’s still very much about the most creditworthy individuals. And though some lenders have announced pretty aggressive offerings of late, such as Carrington’s 550 minimum FICO score for an FHA loan, that type of subprime lending is still few and far between. In fact, originations in the sub-620 bracket still account for less than five percent of residential mortgage lending volume, despite ticking up in recent years. Many expect volume in this higher-risk band to increase as banks continue to grapple with flagging volume. And the trend is already apparent in the FHA realm, where lending to borrowers with scores between 620-719 increased year-over-year after steadily declining. However, the sub-620 category is still pretty flat and that doesn’t appear to be changing anytime soon.